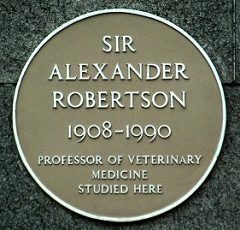 About Sir Alexander Robertson :Veterinary Surgeon. Born in Aberdeen and educated at Marischal College, he became Director of the Royal School of Veterinary Surgeons and Dean of the Faculty of Veterinary Medicine and Professor of Tropical Animal Health at Edinburgh. In 1954 he was elected President of the British Veterinary Association.